The second yacht built on Tankoa’s 70/72-meter technical platform – sold in September 2016 to an experienced European client – his second build with Tankoa– has now been launched and final delivery to her owner is on track for November 15th, 2018. Designed by Francesco Paszkowski – Solowill make her international debut at the 2018 Monaco Yacht Show from the 26thto the 29thof September. 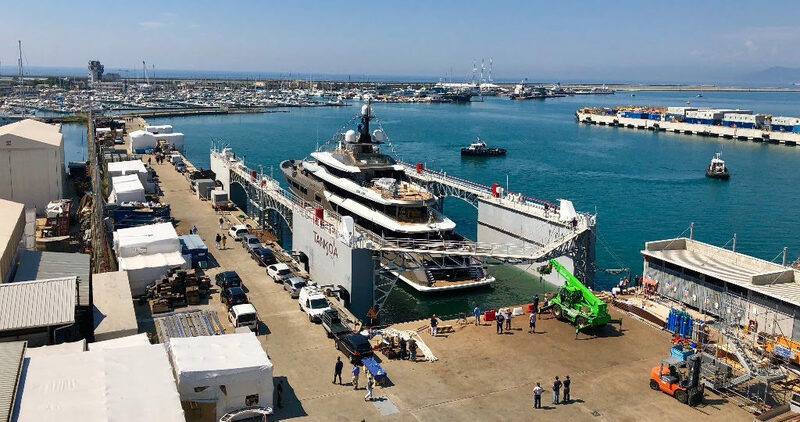 According to Tankoa’s CEO, Euro Contenti – this is a true recognition of the shipyard core values and power that irrevocably consists in building yachts with clients, not for clients. Although reminiscent of 69-meterSuerte (project S693), Solois 3 meters longer and has a volume of approximately 1,600 Gross Registered Tons. Other key differences include catalytic underwater exhausts allowing for substantial gains of volume on all decks, smell free and smoke free outdoor decks; a larger winter garden;larger aft deck with 6-meter transversal glass pool, cut-down glassbulwarks sections for unobstructed sea views and a wide body upper deck allowing for an oversized panoramic salon. The longer waterline also allows for an optimized top speed in excess of 17 knots and reduced fuel consumption. 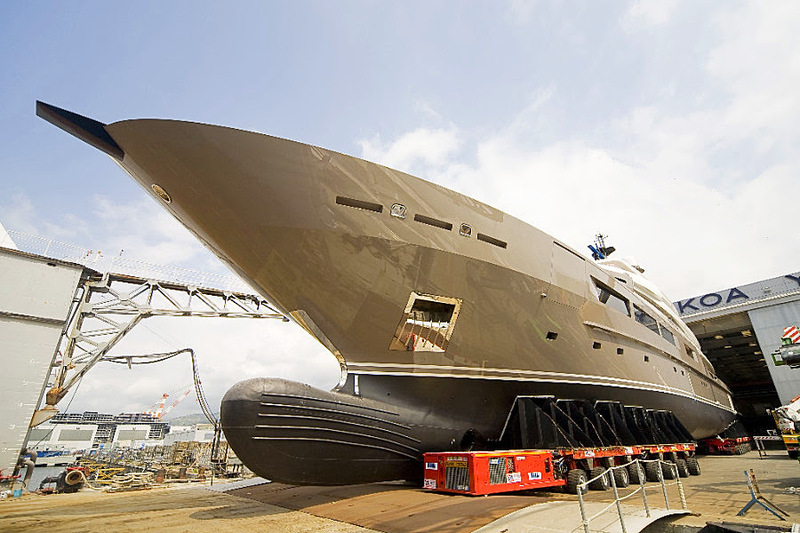 Solo has accommodations for 12 in six cabins, including the master suite on the gigantic private owner’s deck, a VIP suite and four doubles, two of them convertible into twins. In addition, the hair dressing/massage room and the owner’s study can also be converted into additional cabins as they are both equipped with an ensuite bathroom. The VIP and Guest cabins are all on the main deck with astonishing sea views thanks to unusually large windows. The entire boat is equipped with latest collection of sofas and seating by Fendi Casa. The beach club, a key feature onboard Solo,is a spacious and welcoming space. Equipped with generous sofas, bar, TV, oversized glass walled gym by Technogym with fold-out terrace, bathroom, it is also directly linked to the Spa zone. The later comes with a sauna also fitted with its own fold-out terrace for a direct dive after it, hammam and chilled water shower with temperature that can go down as far as 5º Celsius. Purists will surely appreciate! The upper deck houses the paperless semi-integrated Boëning wheelhouse with radio room, captain’s cabin, and hair dressing/massage room. The aft section of this deck features an enormous observation lounge/salon with almost floor-to-ceiling windows, 90” 4K QLED TV screen, baby grand piano, bar and ethanol encapsulated fireplace. The wide-body fully private owner’s deck has direct access from the touch-and-go helideck aft (rated at 4.5 tons for an Augusta 109 or most twin turbine helicopters). This exterior deck is also equipped with its own Jacuzzi, bar, salon, breakfast corner and day head with shower. A stairwell leads to the sun deck, with its shower hidden into the mast, saloon and generous sun pads. The owner’s true apartment features an owner’s study/media room. The island bed is surrounded by full-height windows with180° views with direct access to two intimate side exterior saloon, shaded sun pads and Bisazza mosaic tiled glass walled Jacuzzi. Tenders and toys storages are split between the foredeck and a twin side-loading garage, providing room for two custom-built 7.50 m tenders, PWCs and water toys.The under lower deck is devoted to laundry room, pump room, storage, additional fridge and freezer, garbage treatment plant, technical spaces and direct access to the magnificent split-level engine room. Sales and Marketing Director of Tankoa and board member Michel Karsenti recently commented on the launch of Solo: “Past theemotion of seeing the object that took us close to four years to build and hundreds of thousand hours of hard work and passion, I am thinking about three things. Surely the pleasure the owner and his family who trusted us all along the way will have onboard and his smile when seeing his boat here ready to launch. I am also thinking about the dedication of our craftsmen and artisans who just put their soul into this piece of art and I want to extend my thanks to them. The third thing is, and it is the beauty of our company, we already planned a number of post launch meeting to list where and how we can do even better! 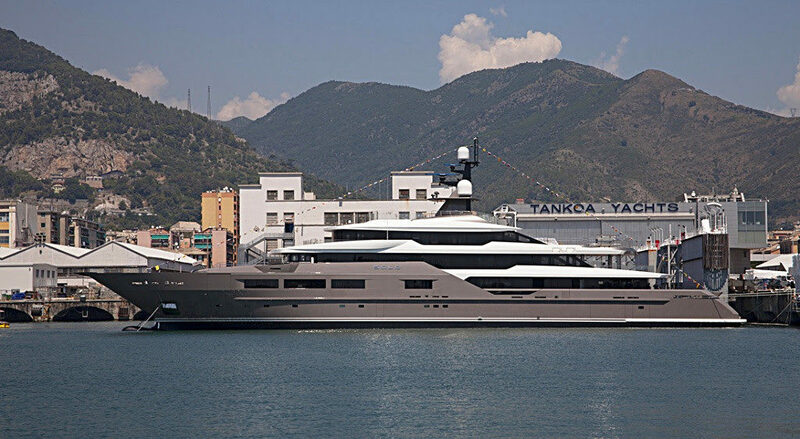 Tankoa is not only a unique shipyard to build a yacht, it is an incredible place to work driven by passion and constant search for excellence from welders all the way to top management. Solo is destined for charter and the owner’s brief called for a circulation plan that allowed the crew to work completely independently from the owner and guest areas for maximum privacy. He further requested a décor that is modern, elegant and warm. Both the GA and décor are the result of a collaborative effort by Francesco Paszkowski and Margherita Casprini.